Donald “Cowboy” Cerrone, one of the fastest-rising stars in the history of the Ultimate Fighting Championship (UFC), currently is fighting in his second year in the welterweight division. 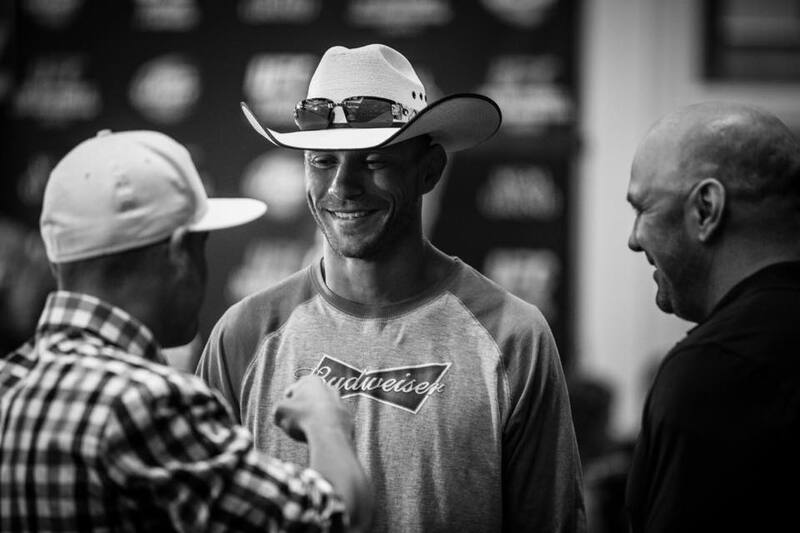 Renowned for sporting his trademark cowboy hat outside the Octagon, Cerrone is a fan favorite and one of the most dynamic and popular personalities in the sport. He also is one of the most fully-sponsored, representing Budweiser, Bad Boy Buggies, E-Z-GO, FRAM and Monster Energy. Training out of Albuquerque, N.M., Cerrone has fought professionally since 2006. He boasts a 32-8-0, 1NC record in his professional Mixed Martial Arts (MMA) career, and a 25-8-0, 1NC UFC record since joining the biggest MMA organization in October 2010 when the UFC merged with the World Extreme Cagefighting (WEC). Prior to the merger, the 6’1” fighter enjoyed great success honing his skills as a WEC and Ring of Fire kickboxing competitor, amassing an impressive 13-3-0, 1NC record during this nearly five-year building phase of his career. In addition, Cerrone holds the record for most post-fight bonuses (Fight/Performance of the Night and Knockout/Submissions of the Night) to-date in UFC/WEC history with 18. Born in Denver, Cerrone attended Air Academy High School and began feeding his competitive fire in professional bull riding prior to venturing into kickboxing during his sophomore year. With the heart of a champion, he quickly proved himself adept at kickboxing and went on to compile an undefeated, 13-0 record as an amateur. The next challenge was training in Muay Thai kickboxing, and upon turning professional, he posted another unbelievable, undefeated record of 28-0 with 18 first-round knockout wins and a total of four kickboxing championships before transitioning to MMA in 2006. The Freedom Fighters gym in Commerce City, Colo., served as the backdrop for the birth of Cerrone’s fighting career. From there, he next trained at Greg Jackson’s Submission Fighting Gaidojutsu School in Albuquerque with Jon Jones, Rashad Evans, Nathan Marquardt, Keith Jardine, Georges St-Pierre, Leonard Garcia and Tom Watson along with other skilled MMA fighters. February 2006 ushered in the first professional fight of Cerrone’s MMA career. He won the match via submission (triangle choke) and proceeded to win nine of his first 10 bouts. In his first 17 professional MMA fights prior to seguing to the UFC, Cerrone posted 13 wins, three losses and one NC through December 2010. He garnered mainstream notoriety with impressive WEC battles that skyrocketed him to MMA stardom. Cerrone also became known as a fighter always up for a challenge by agreeing to participate in fights on short notice. During his WEC career, Cerrone accumulated five Fight of the Night honors. The fighter’s charisma and prowess also attracted television producers, who invited him to be a part of the Versus reality television series, TapouT, prior to his fight with Anthony Njokuani at Ring of Fire 29 in April 2007. The fact Cerrone had trained among the best in the field was evident in his UFC debut at UFC 126 in February 2011, where he bested Paul Kelly via submission (rear naked choke). For their performances, both fighters earned “Fight of the Night” honors. The success didn’t stop there, though. Through intense training, commitment and hard work, Cerrone rode a hot streak that saw him go undefeated through the next three fights, beating Vagner Rocha via unanimous decision (UFC 131; June 2011), Charles Oliveira via TKO three minutes into the opening round (UFC on Versus 5 on Aug. 14, 2011; earned “Knockout of the Night” honors) and Dennis Siver via first-round submission (UFC 137 on Oct. 29, 2011; “Submission of the Night” honors). Defeat first visited Cerrone in his fifth UFC fight — UFC 141 in December 2011 — via unanimous decision versus Nate Diaz in a performance that earned both men “Fight of the Night” accolades. He quickly channeled that disappointment into motivation and won his next two fights before losing to Anthony Pettis in January 2013. However, Cerrone bounced back in the next bout with KJ Noons at UFC 160 in May 2013. Three months later, he succumbed to Rafael dos Anjos in August at UFC Fight Night: Condit vs. Kampmann 2. Setting the standard, the then-lightweight fighter remained undefeated between the dos Anjos matchup in August 2013, and through UFC 187 on May 23, 2015. Cerrone rode an eight-fight win streak through UFC 187, when he beat John Makdessi via TKO after breaking his competitor’s jaw with a head kick in the second round. That showing secured his place as the No. 1 contender for the lightweight championship, setting up a highly anticipated rematch and title fight Dec. 19, 2015, when Cerrone faced dos Anjos in a battle for the UFC Lightweight Championship. Cerrone lost in the first round but emerged more focused and motivated than ever, ending 2015 with an impressive 3-1 record. He was ready to make the move to welterweight (170 pounds). In his welterweight debut, Cerrone defeated Alex Oliveira in the main event at UFC Fight Night in Pittsburgh on Feb. 21, 2016. Cerrone triumphed in the first round with a triangle choke, marking his 30th UFC bout in just five years and earning “Performance of the Night” honors. In his second fight at welterweight at UFC Fight Night on June 18, 2016, Cerrone beat Patrick Cote to claim the rare distinction of being ranked in two separate weight divisions of the UFC simultaneously. After the bout in Ottawa, Canada, the sport’s first stop in the city, he was ranked fourth in lightweight and 14th in welterweight. Cerrone scored the victory over Cote at 2:35 in the third round via TKO after dominating the Canadian with his quickness and versatile striking ability. The showing earned Cerrone “Performance of the Night” honors. At UFC 202 in Las Vegas on Aug. 20, 2016, his third match at welterweight, Cerrone furthered his undefeated streak in the weight division by beating Rick “The Horror” Story via a second-round TKO at 2:02 at at T-Mobile Arena. Cerrone became the first fighter ever to beat Story with strikes, and he did so while battling a severe headache that kept him in the bed much of the morning. Cerrone rose above his physical challenges, though, to dominate in the Octagon and earn “Performance of the Night” honors and the accompanying $50,000 bonus. The award marked his third “Performance of the Night” designation for the third consecutive fight, coming in his third match in the welterweight division. In a disappointing last-minute turn of events, Cerrone’s highly anticipated Nov. 12, 2016, welterweight matchup against Kevin Gastelum at the historic UFC 205 at New York City’s Madison Square was cancelled after his opponent failed to make weight. The fight marked the first in New York since a ban on professional MMA, dating back to 1997, was lifted earlier in 2016. Cerrone forged ahead and upheld his undefeated streak at welterweight at UFC 206 on Dec. 10, 2016, against Matt Brown at Air Canada Centre in Toronto. Cerrone defeated Brown via KO at 0:34 in the first round, marking his fourth consecutive victory since moving to welterweight. However, Cerrone’s impressive four-fight winning streak came to an unfortunate end Jan. 28, 2017, at UFC Fight Night in Denver. Fighting in front of a hometown crowd at Pepsi Center, Cerrone, ranked No. 5, lost to No. 12 Jorge Masvidal via TKO at 1:00 in the second round. In his 34 UFC career fights (as of May 1, 2017), Cerrone has earned 25 wins, eight losses and one NC, in addition to 18 honors, including Fight of the Night (eight), Knockout of the Night (three), Performance of the Night (five) and Submission of the Night (two). In 2015, ESPN named him Best Fighter of the Half-Year, and in 2011, he earned Breakthrough Fighter of the Year in the World MMA Awards. Sports Illustrated honored him with the 2009 Fight of the Year award, and he earned 2009 Fight of the Year and 2008 Round of the Year at the Sherdog Awards. In addition, Cerrone has been honored multiple times by MMAFighting.com, FightMatrix.com, TheMMACorner.com and MMAJunkie.com. Cerrone’s star power is crossing over to Netflix in 2017. He has been cast in Godless, a new, six-episode miniseries. The series, a period piece set in 1884 from creators Scott Frank and Steven Soderbergh, was filmed in Cerrone’s home state of New Mexico. He plays a character who is part of a train robbery gang. To learn more about the miniseries, click here. Cerrone also hosts a podcast, available on iTunes HERE. Cerrone’s bi-weekly podcast, or “Partycast,” as he calls it, offers compelling interviews with and stories from UFC’s top stars. In March 2017, Cerrone began filming a movie titled Puppy Love. The dramatic comedy also stars Hopper Penn, Paz de la Huerta, Michael Madsen, Rosanna Arquette and Colleen Camp. Puppy Love is based on a year in the life of music video director Michael Maxxis’ male cousin, Morgan Fairchild. The movie, in which Maxxis directs from his screenplay, portrays Fairchild as falling in love with a homeless woman, and details his story as their dysfunctional relationship morphs into one of beauty. To view Cerrone’s UFC Fighter Page, click here.